The objective of DAQ BATS is to provide personal attention to each and every bat order. Whether it is hand selecting billets, helping the customer determine what type of bat is best for them, customizing the size and shape or personalizing the bat with custom lettering each detail of production is given my personal attention. 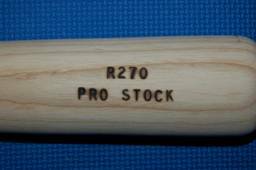 The single most important factor for a quality baseball bat is the material it is made from. DAQ BATS uses only #1 grade (PRO STOCK) ASH and PRO HARD MAPLE from one of the largest bat billet producers in the world. The billets used at DAQ BATS are from the same supplier of many large well known bat companies. This allows DAQ BATS to deliver to you the same quality product while providing a better value.